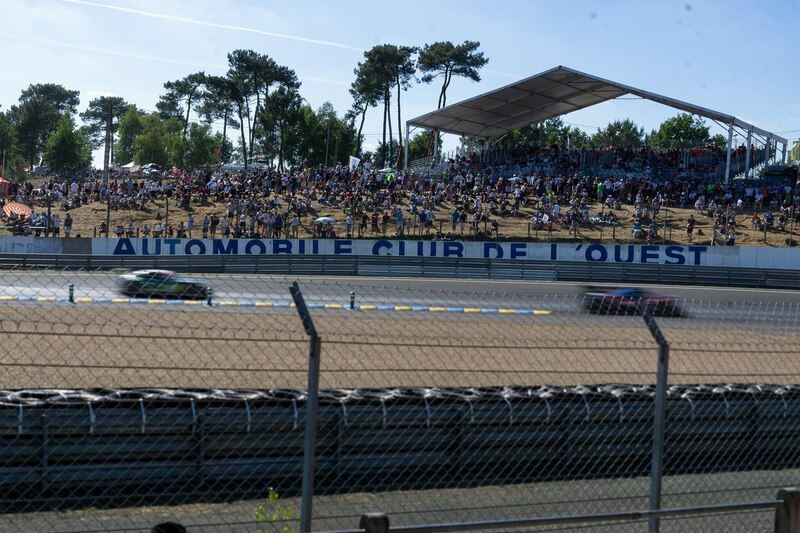 I’m going to start off with an obvious truth: everything about the 24 Hours of Le Mans is intense – from the 3PM thundering explosion of sound, to the Porsche Camp’s celebration while the Toyota’s dreams literally burn in front of them, to the end-of-race nerves as a lone, damaged C7.R Corvette fends off two predatory Astons. 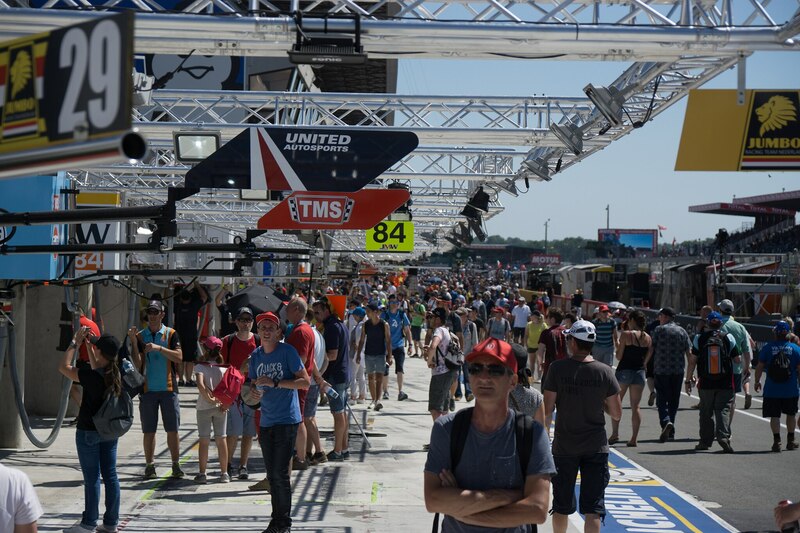 However, the race is 24 hours long, so interspersed between these bouts of adrenaline and excitement are long stretches of bizarre normality. To depict this contrast and the sheer scale of the event I’ve portrayed the 2017 race with a lap-based timeline. 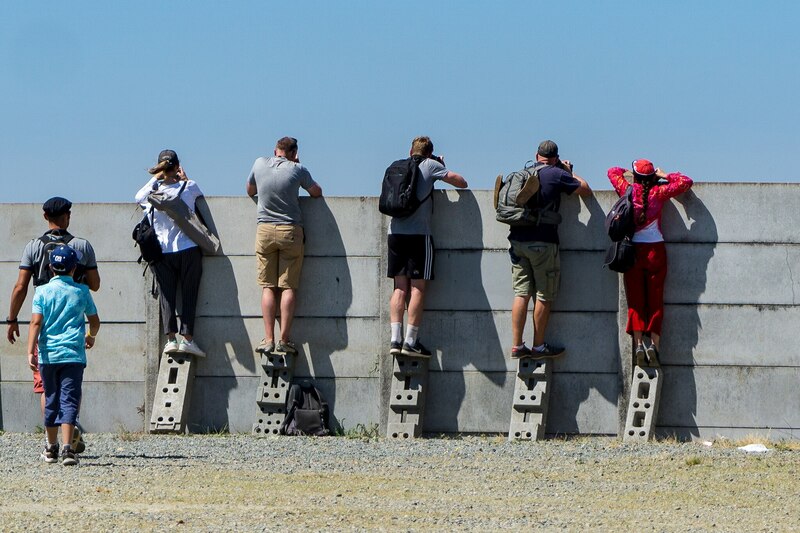 For the time junkies out there, each lap of the 8.47-mile semi-public course averages out to 3 minutes and 55 seconds for a total of 367 laps over 24 hours. Lap 0: Situated over Dunlop Hill at the Esses, we couldn’t see the start, but we definitely heard it. 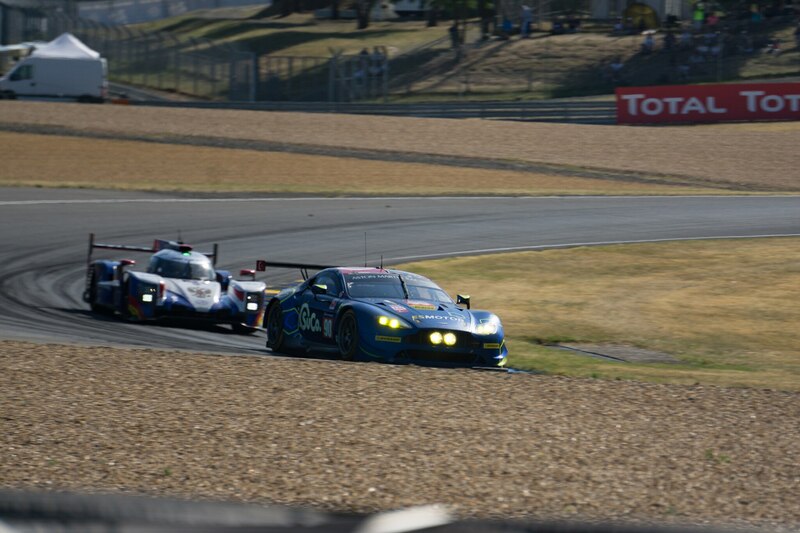 At 3PM, the racers, previously puttering behind the safety car, transformed into monsters, explosively converting fuel into fire and ejecting it out the back. 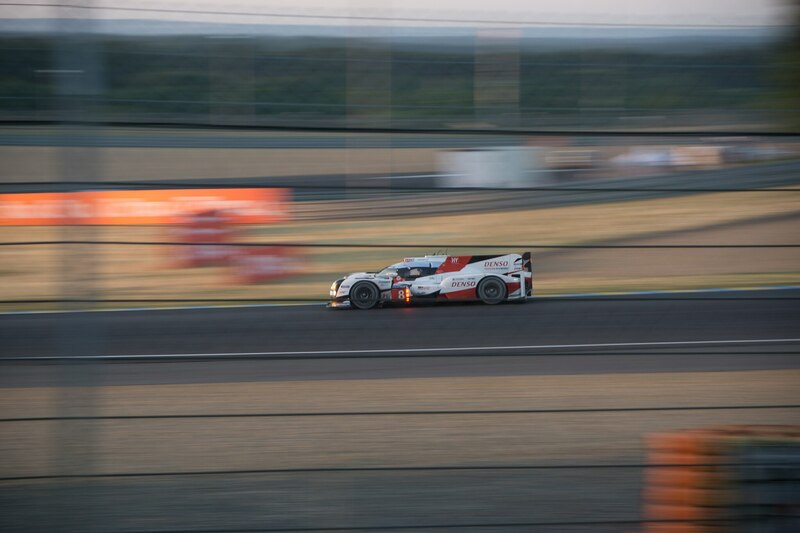 The collective rumble of 60 charging vehicles grew into a roar as the first of the ill-fated LMP1 cars crested the hill. 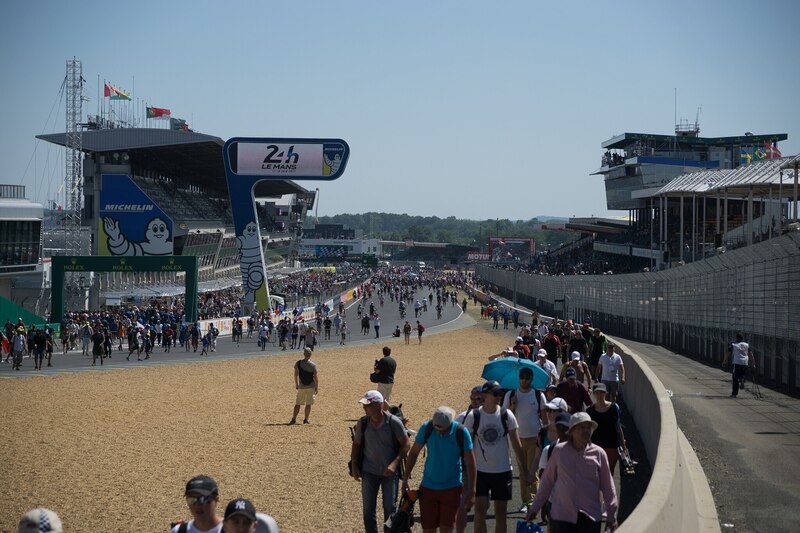 Thundering down the backside of the hill and swooping through the Esses, the vehicles drowned out the ocean of screaming spectators, leaving the smell of race fuel and hot rubber hanging in their wake. Lap 1: Everyone standing at the start suddenly realized the hilarious impracticality of standing for 24 hours straight and sat down. 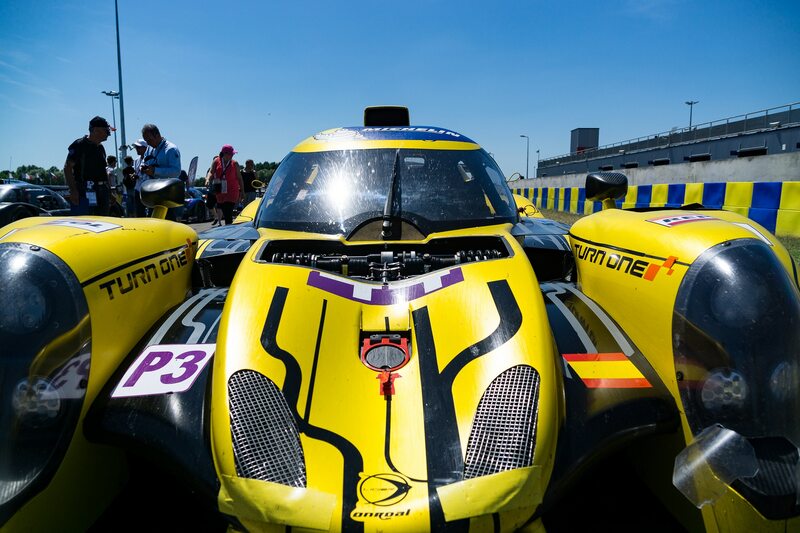 A side note: The first LMP1 dropout suffered terminal damage before the fans even sat down. Lap 25: Settling in for the long run, I began ranking cars based on exhaust note. 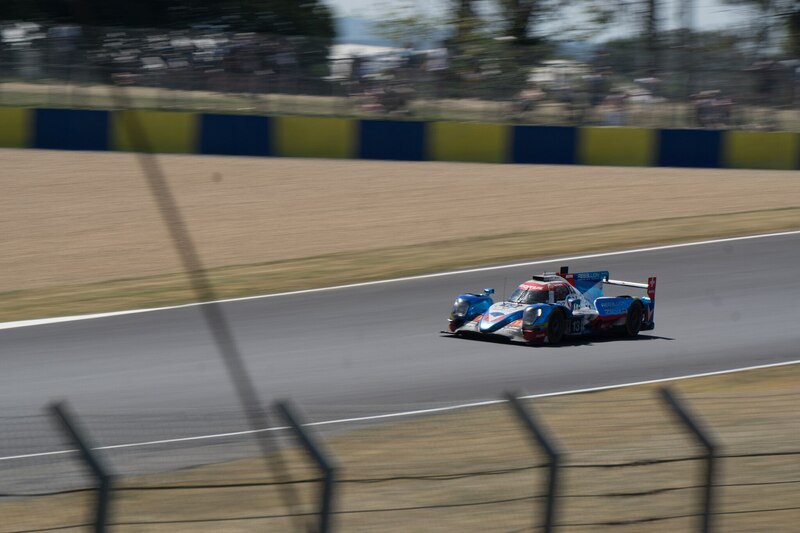 The hybrid LMP1 cars were disappointingly quiet and most of the LMP2s ran the same motor, making for a rather homogenous experience. The real debate was in the GTE Classes. The various engine makes created an orchestra of deep chest thumping basses, vibrating growls, soothing mid-tones, and screaming sopranos. All this was interspersed with various bangs, pops, and cracks as the different anti-lag systems kicked in. 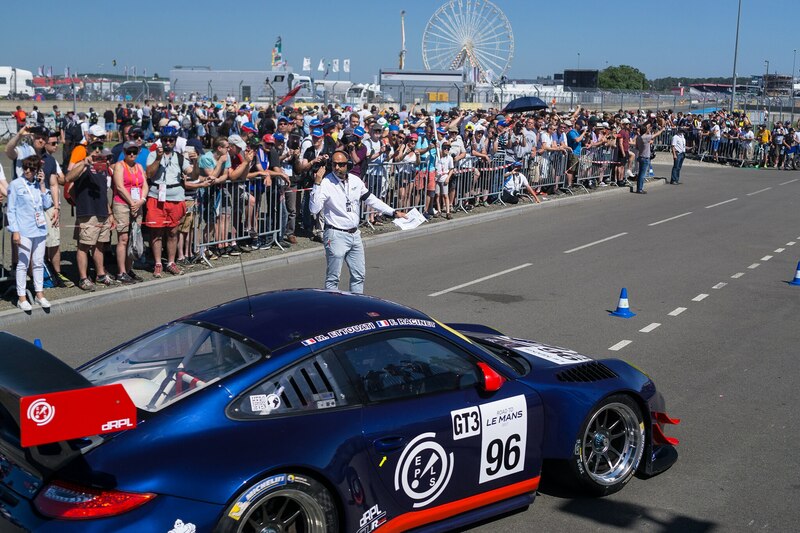 Aston Martin took victory with a classy baritone that thrummed just enough to remind you of its power, while the Porsche RSR was worst with a thin, high-pitched shriek that made me wonder if their health insurance covers ear specialists. 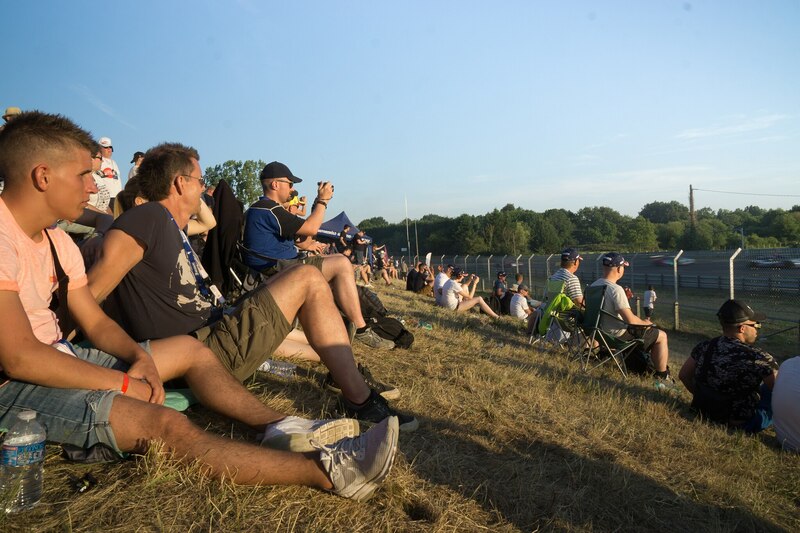 Lap 40: Two and a half hours into the race, we ventured out of the shaded grandstand to the less traveled sites inside of the Esses. 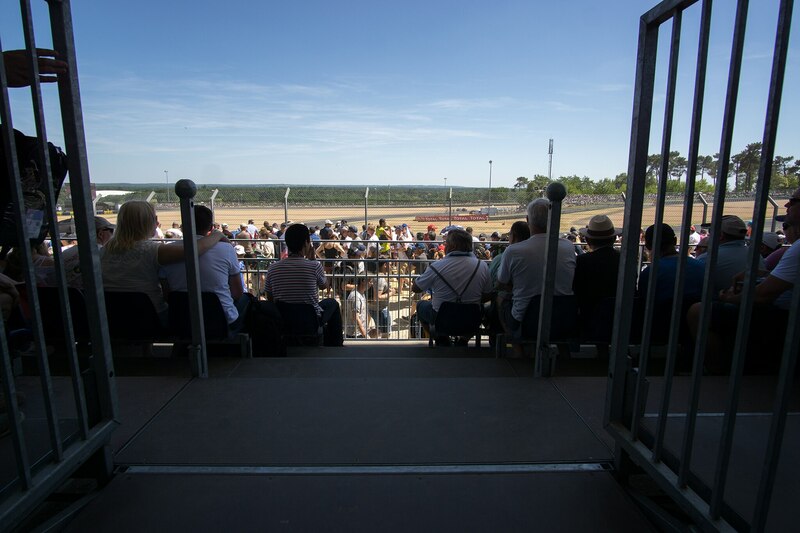 The banked turn provided a perfect view into the cockpits as drivers fought every twitch of the car and rocketed towards Tertre Rouge. 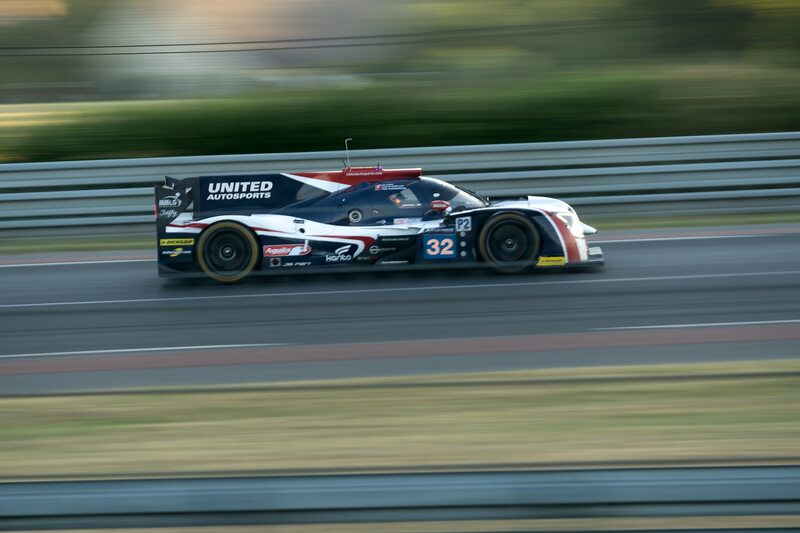 The sheer violence visible in their corrections reminded me why “motorsports” includes the word “sports”, and the LMP’s aerodynamic body work and unbelievable speed burned artwork-like blur lines on my retinas. Lap 44: We had enough of the sweaty 85-degree heat and made our way back to the campsite to enjoy a drink in our air-conditioned rental. 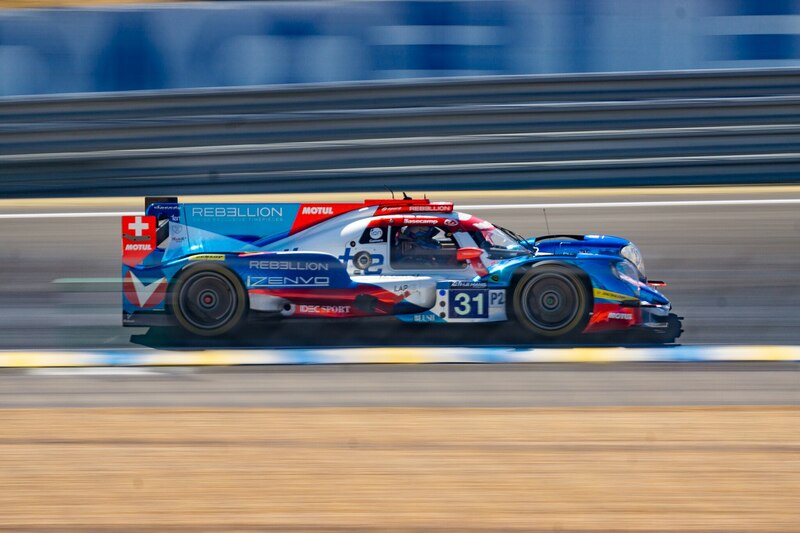 The irony of listening to the race in a car while literally in the middle of Circuit de Sarthe was not lost on us. Unfortunately, we forgot to bring a bottle opener, almost ruining our relaxing break. However, one of our neighbors saved the day, reaching down from his RV into the window of our Mini – gifting us an extra one. We were both stunned because our only other camper interaction was with a group of drunken Frenchmen dressed in Lederhosen while waving the Union Jack. They barricaded the camp road the night before and danced around passing cars, demanding burnouts as the toll, so the last thing we expected was a sane helpful camper. 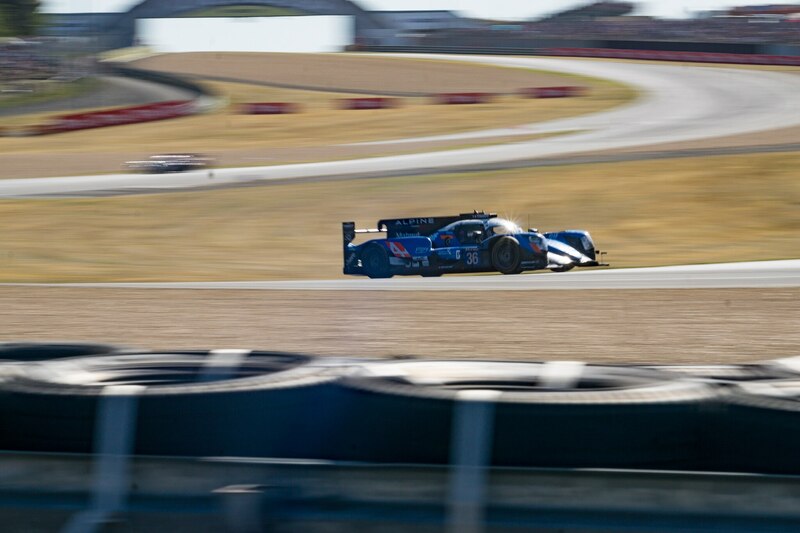 On the race front, the #2 Porsche was the second LMP1 victim, pitting for a 65-minute rebuild. Improbably, this car will win the race. 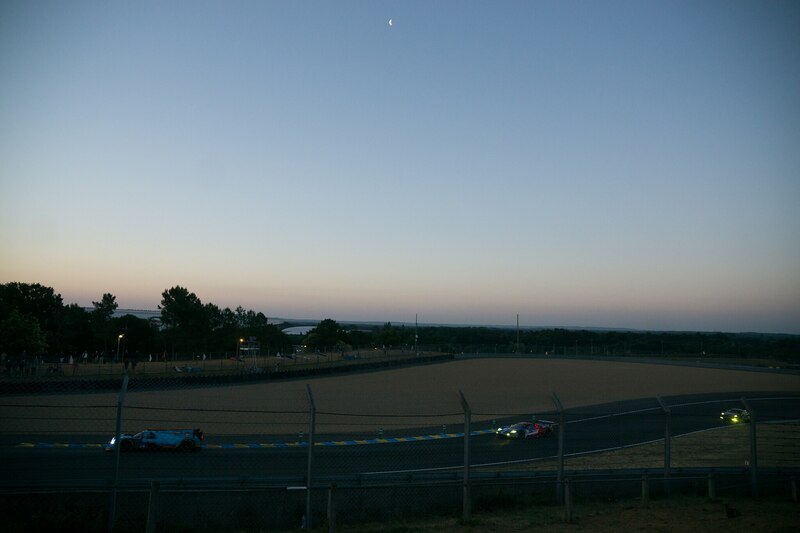 Lap 93: With night approaching, we picked our way towards Porsche Curves. 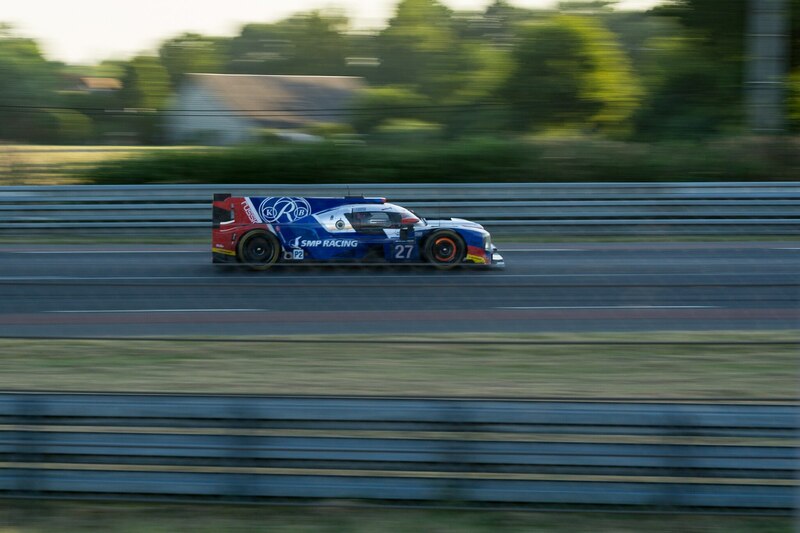 As the sun was setting over the French countryside, an 80-km/h slow zone was enforced, so drivers rocketing out of Indianapolis and Anarge stood on the brakes and wrestled cars down to the speed limit. 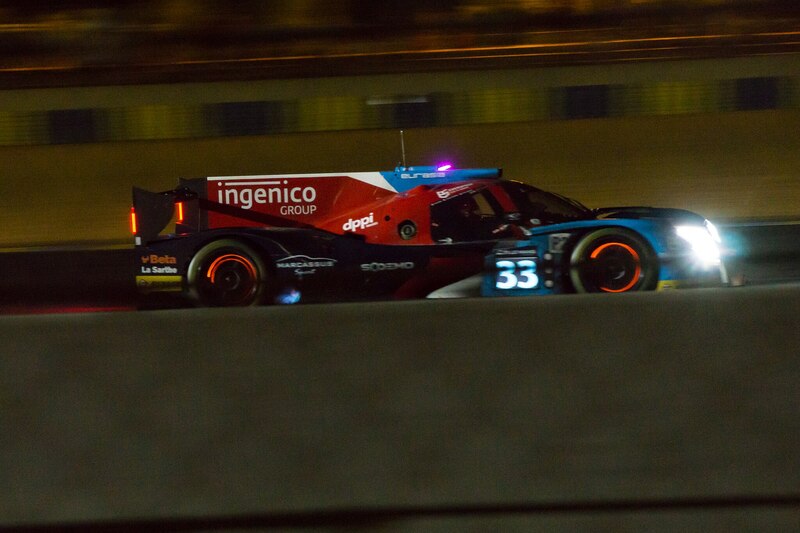 Their glowing brake rotors complemented any choice of sundowner beverage and the LMP2 anti-lag filled the air with the sickly-sweet scent of partially burnt fuel, perfecting the scene. The gorgeous sunset and cooler temperatures put everyone in a fantastic mood, and waves of laughter and general contentedness emerged from the din of conversation. We even saw the German dressing, English flag waving Frenchmen again. 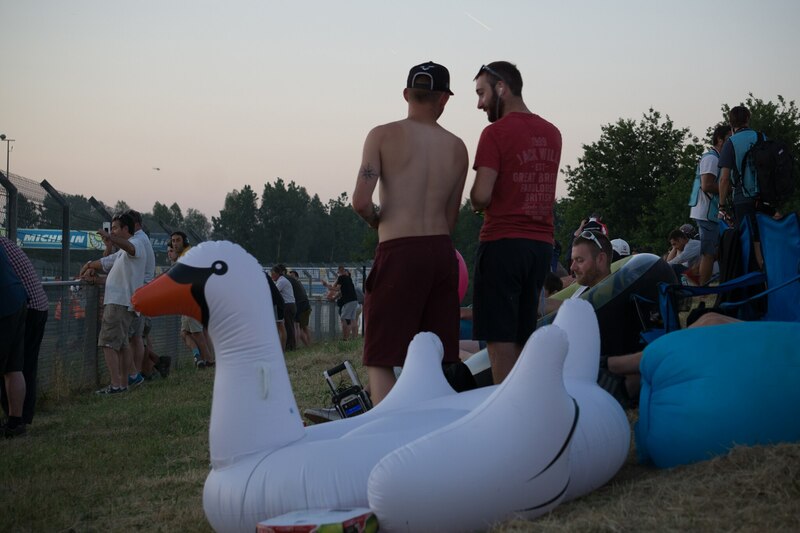 This time they were less obtrusive – dressed in normal clothes, lounging in inflatable animal chairs, and enjoying the sunset with everyone else. 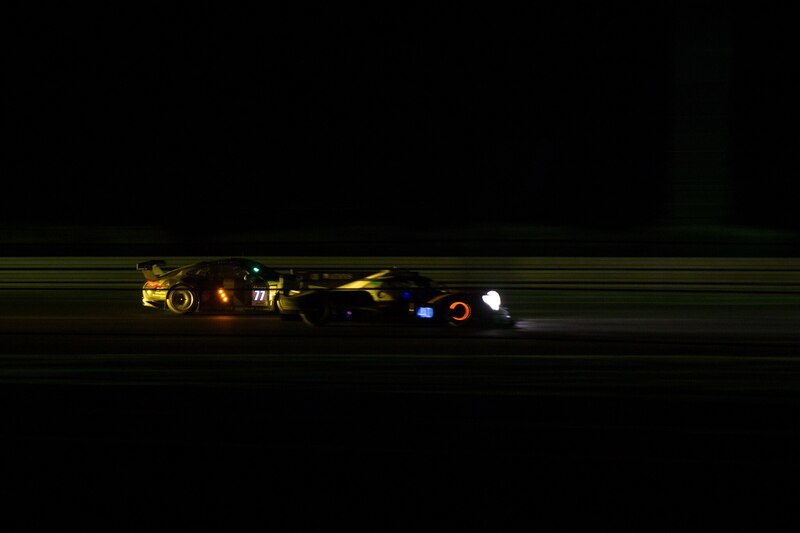 Lap 154: After a quick energy and food pit stop we returned to Porsche Curves at 1 AM, just in time to witness the #7 Toyota call it quits. Unfortunately, that was directly in front of the Porsche Team campsite. 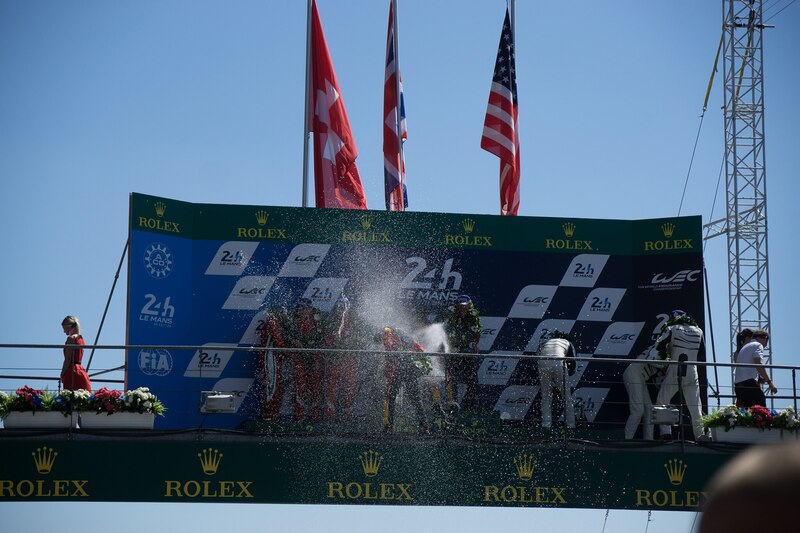 Their camp exploded in celebration – the Toyota LMP1 team was out of the race! Just a few minutes earlier, the #9 Toyota retired first, and 2 hours before that, the #8 Toyota underwent a repair that left them dead last. 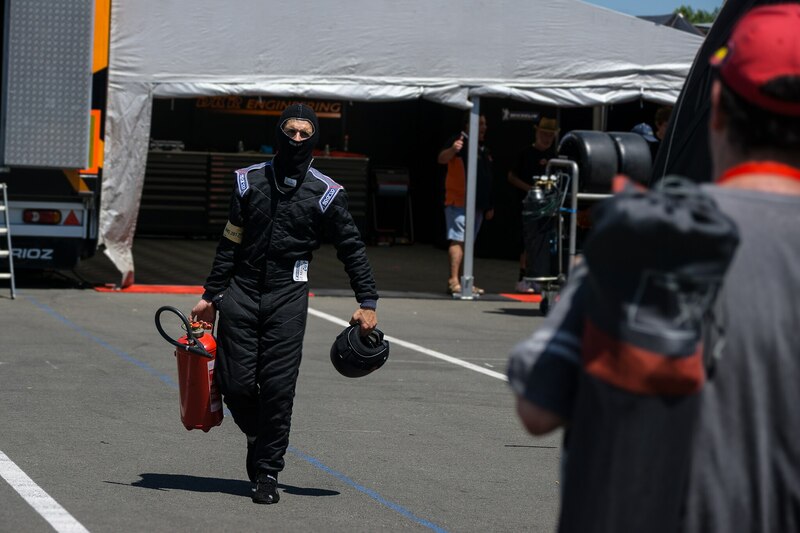 Unfortunately, the Porsche chants picked up again when the battle weary Kamui Kobayashi exited his battered machine and waved at the crowd – not realizing those cheers were not meant for him. As a Toyota fan, that was heartbreak. Laps 180-215: I don’t know if there is any link between excessive Red Bull consumption and a distorted sense of time, but 3-5 felt like a dream sequence. 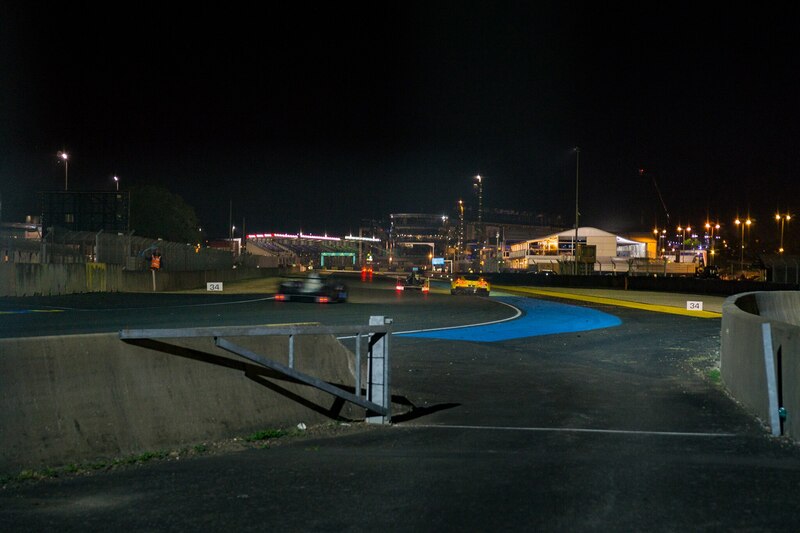 Since most people went to bed by 3 AM, the circuit was bizarrely empty. 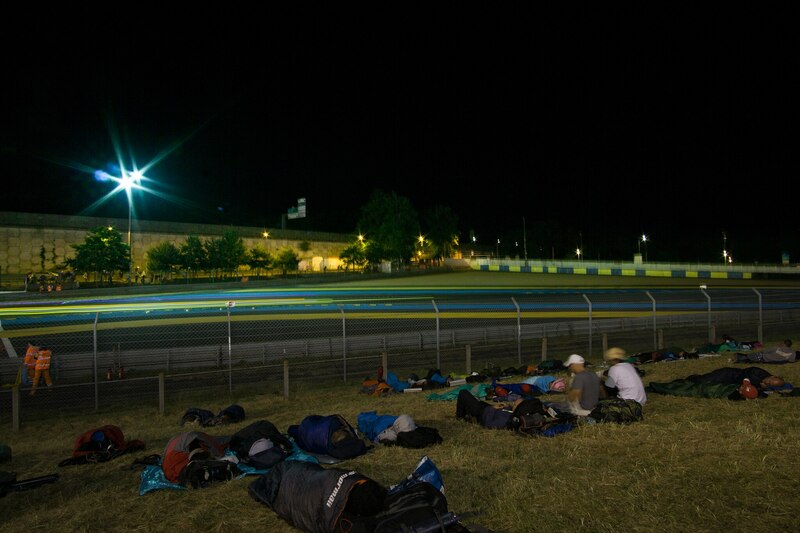 In the place of 250,000 screaming people were a few clusters of night owls and overwhelming quiet. Humid air stifled most sounds and the dark draped like a blanket over the landscape. 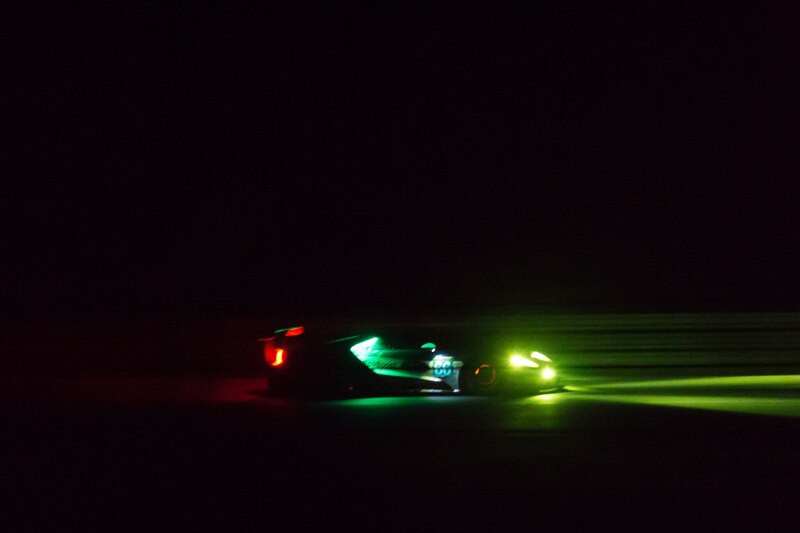 Racecars, with their various headlights, cabin lights, and LED strips emerged from and dissolved into the black tapestry, producing a surreal show that put bioluminescent deep-sea creatures to shame. Couple that with the scents of sharp fuel, coarse smoke and pungent hot rubber emanating from below, and it was motorsports nirvana. 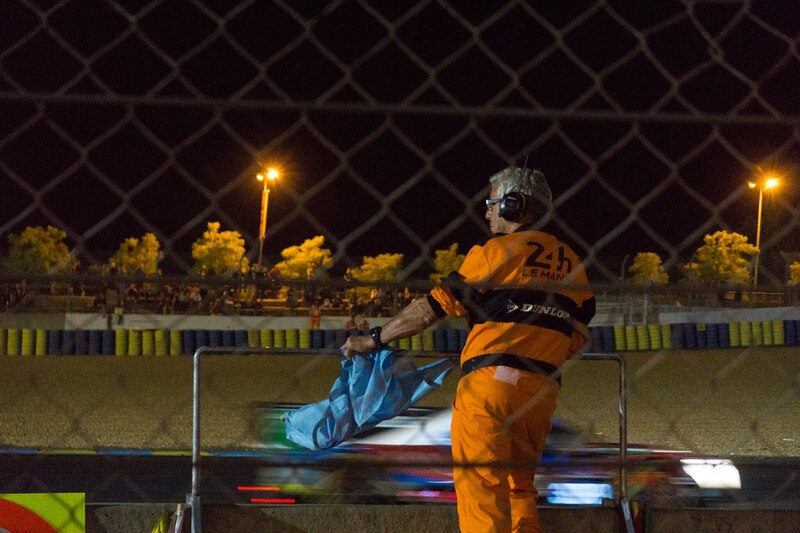 However, the most astonishing thing about the night racing was the calm. 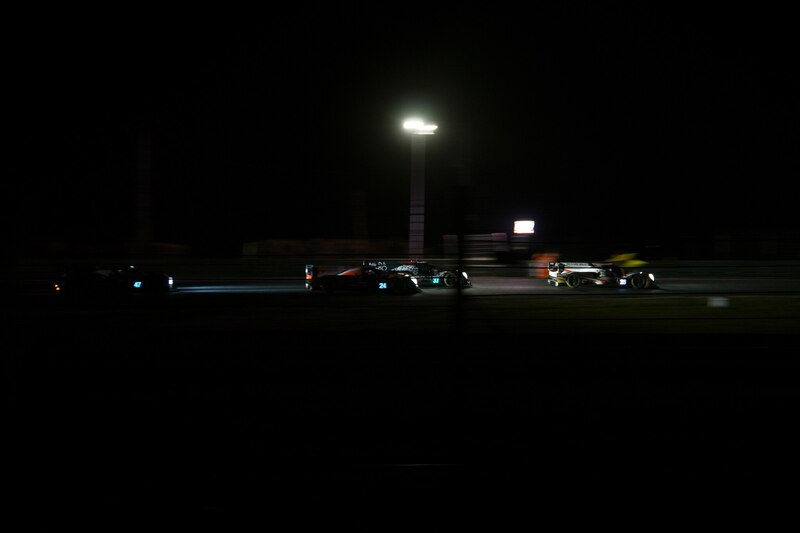 The still, cool air of the night, and the repetitive approach and retreat of the engines worked together to create a meditative experience that belied the violent abuse both drivers and cars experienced. 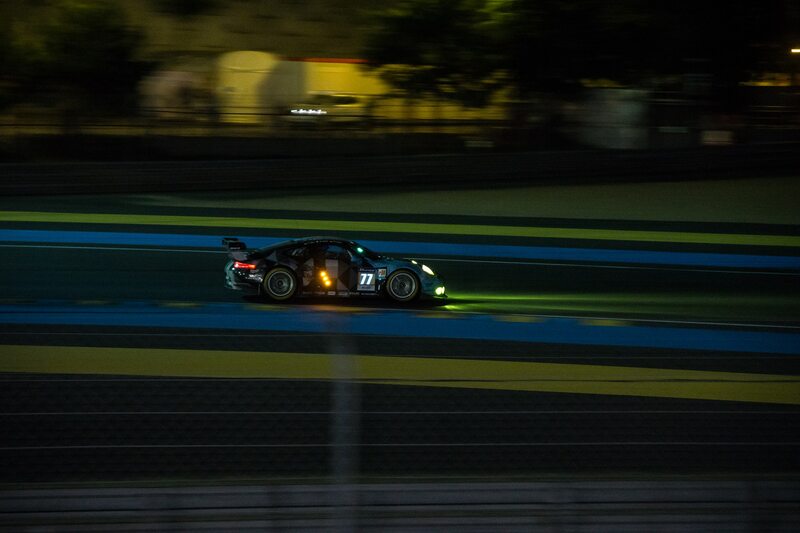 Except for the hellacious Porsche RSR. While battling a Corvette for 2nd, it went out of its way to highlight the titanic struggle with its own driver and made you suffer with it. The “12 year olds hacking at violins” exhaust note violently murdered my zen, leaving me annoyed at the German engineers responsible. 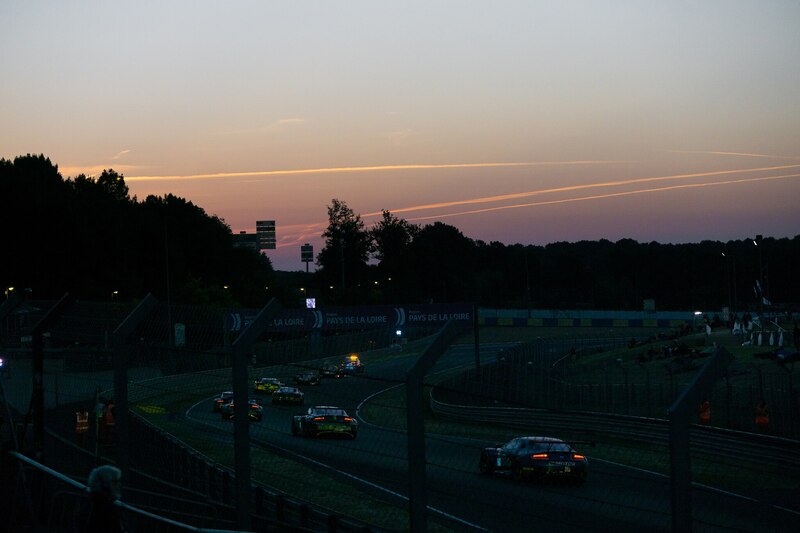 Lap 230: Working its way around the Earth, the sun illuminated the track with the pinks and purples of pre-dawn. 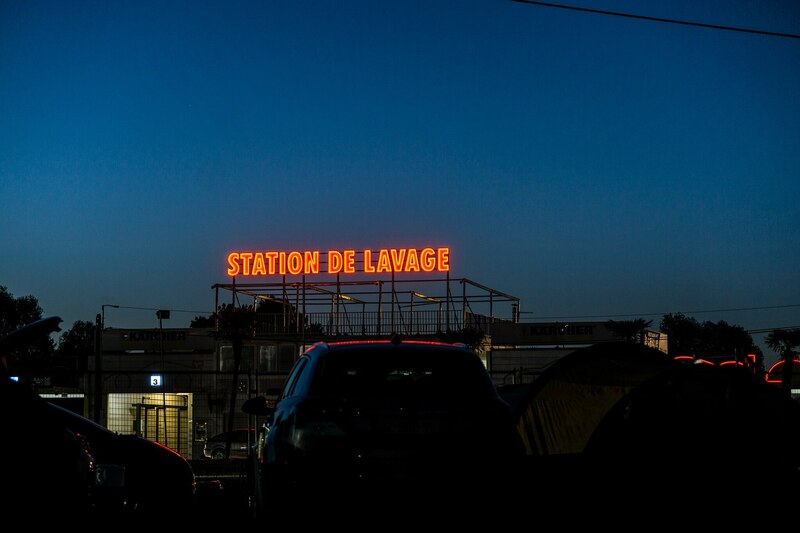 The growing light revealed people asleep in chairs, groups guarding the best viewing sites and individuals passed out from booze. 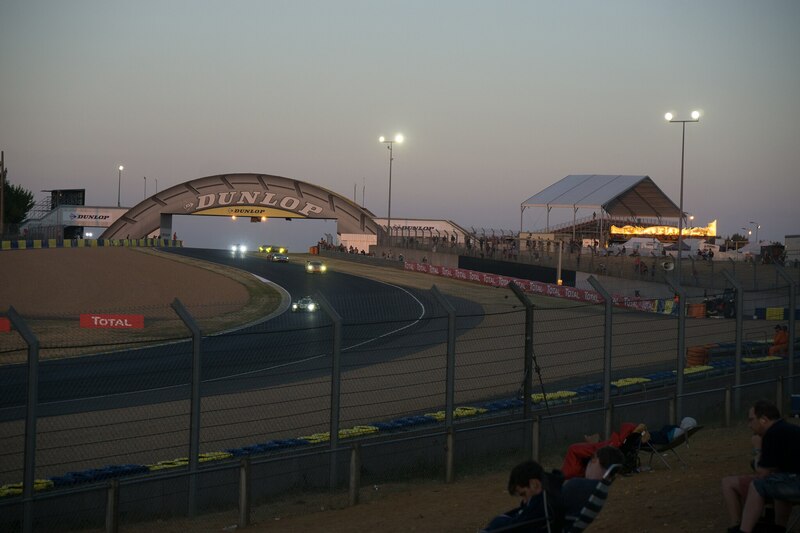 Dunlop bridge improbably glowed pink and there was a swell of optimism as the surviving cars boldly charged headlong towards Tertre Rouge with sunrise orange streaking off their bodywork. 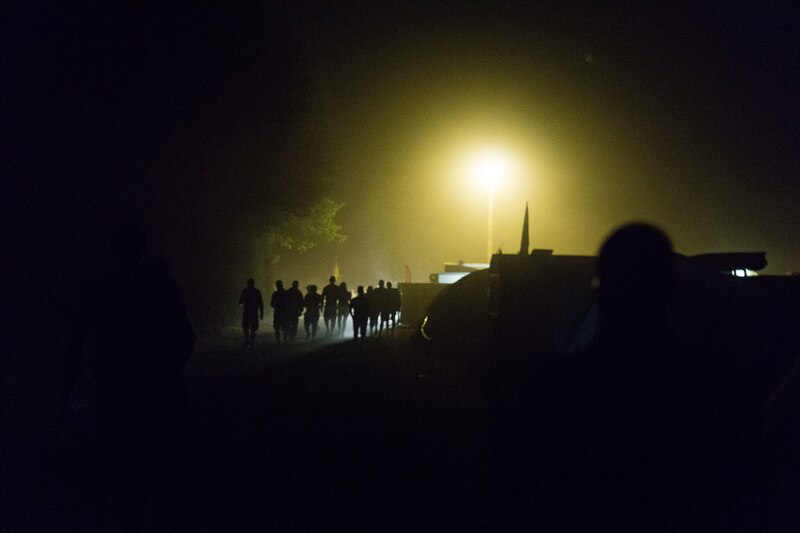 It’s easy to believe that making it to dawn guarantees survival, but it’s only 6 AM and there are still 8 hours for something to go catastrophically wrong. Lap 247: I wish I could say I stayed up for the entire 24 hours, but that would be a lie. 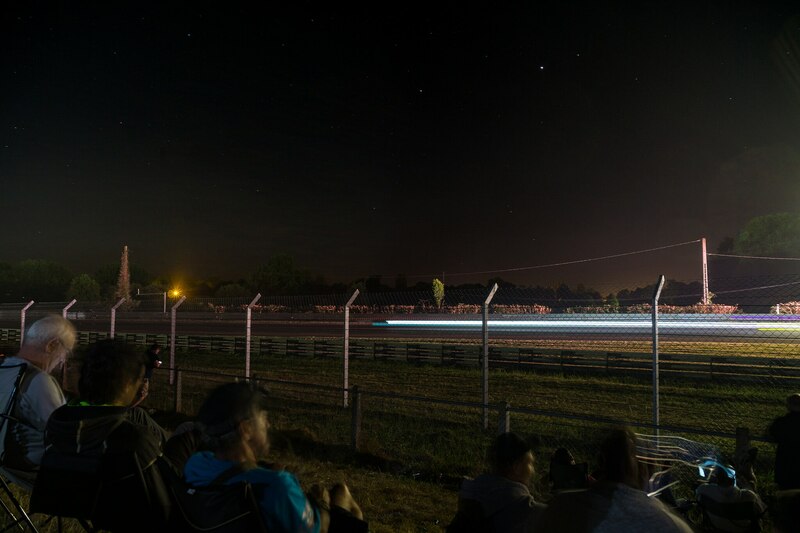 Falling asleep in camp to the sonorous drone of performance engines reverberating off trees (yes, even the RSR’s) was the best bedtime soundtrack I’ve experienced. 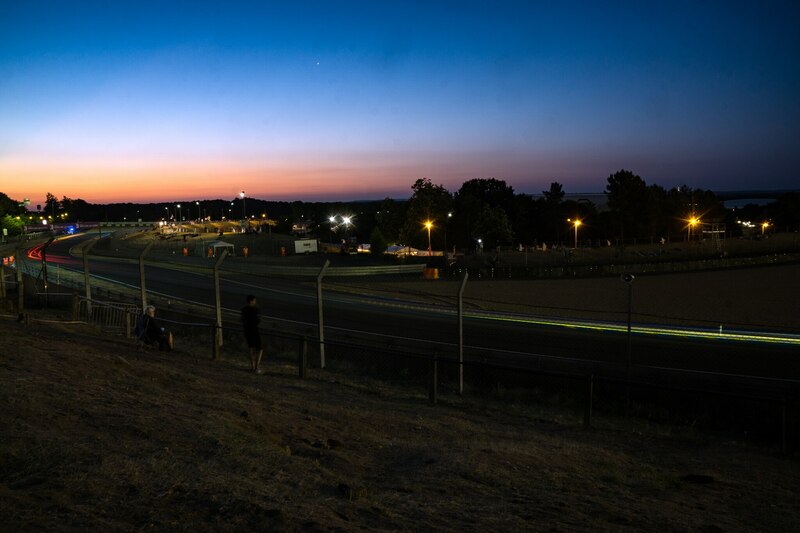 Lap 333: Returning to the grandstands at noon after leaving at sunrise was literally night and day. The people unconscious in chairs – alert, the groups – happy their dedication paid off, and the drunks – still passed out. However, in addition to the morning crew, there were also the few hundred thousand normal people who slept in camp last night. 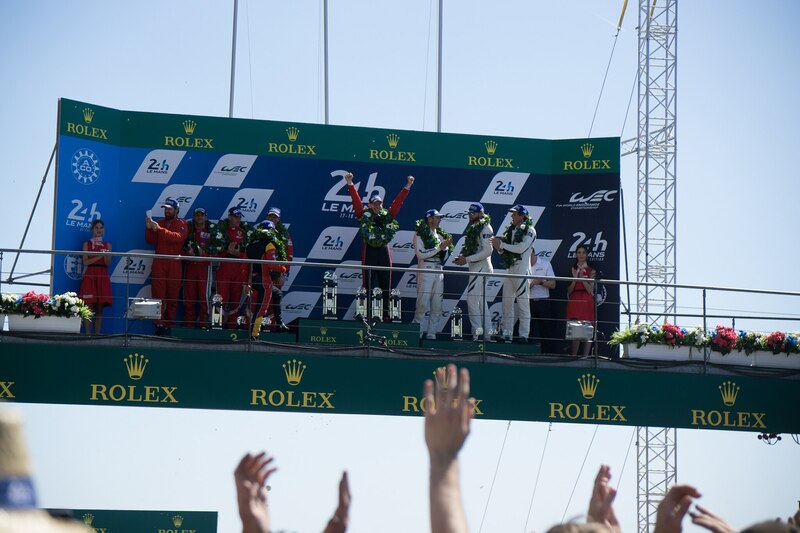 When the first place Porsche LMP1 car retired, most shrugged – it was expected. 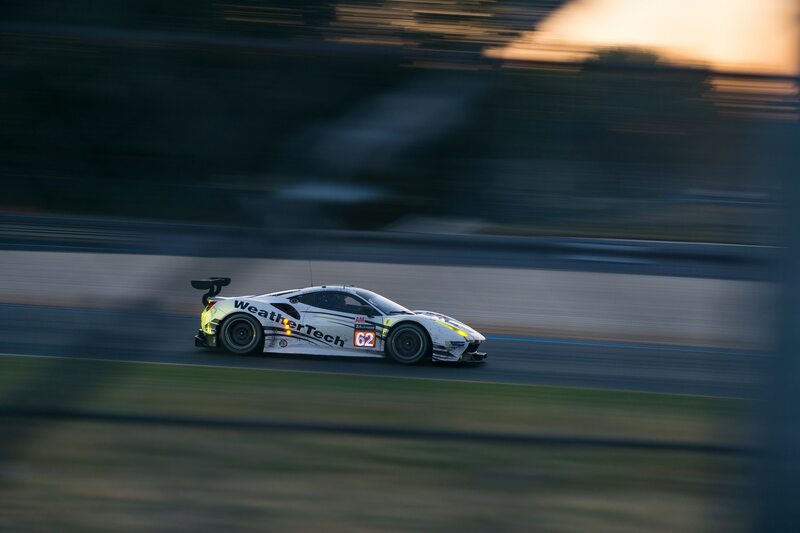 With Aston retaining first in the GTE-PRO class, the entire LMP1 class had officially dropped below British Leyland levels of (un)reliability. 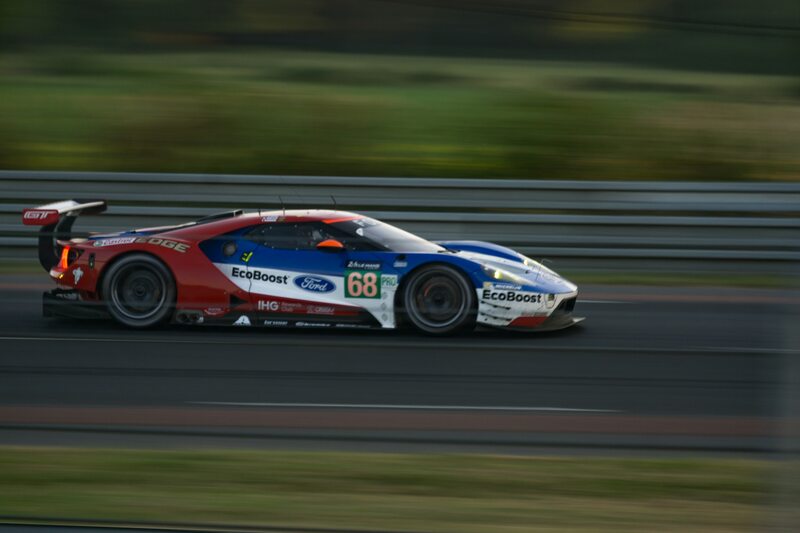 Lap 367: The final laps were, as always, white knuckle tense. Just an hour earlier, the Corvette took first place. 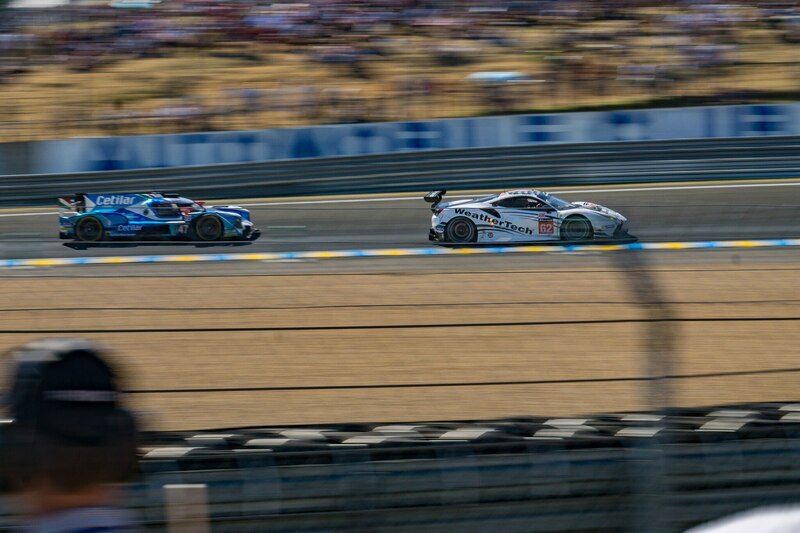 Now, with the clock inching towards 3PM, the C7.R drove its heart out, desperately fighting off the two prowling Astons ready to exploit every mistake. An American myself, my heart leapt every time the Corvette had to bully an Aston off the racing line or make a daring swoop to the inside. Unfortunately, the hometown hero blew a tire, resulting in another letdown and spontaneous celebration from the English crowd. 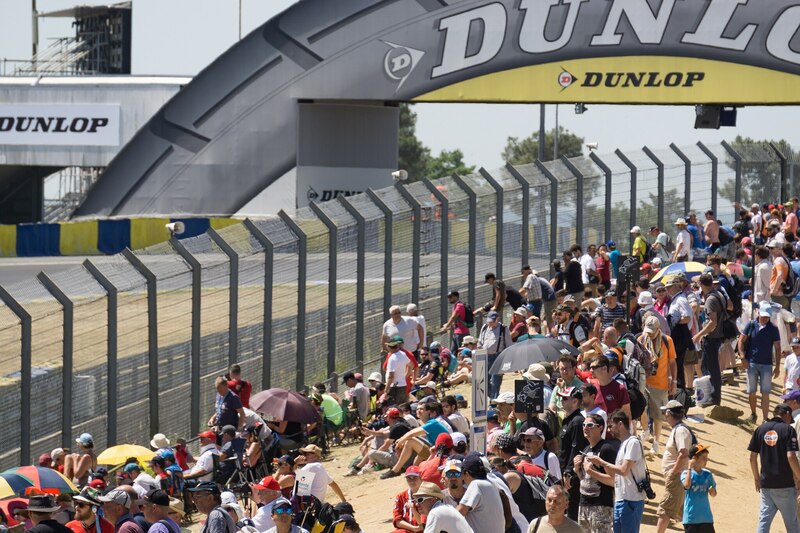 When the last cars pitted, spectators poured onto the course through the opened gates. Basking in the post-race afterglow, we strolled through Dunlop Curves towards the start. 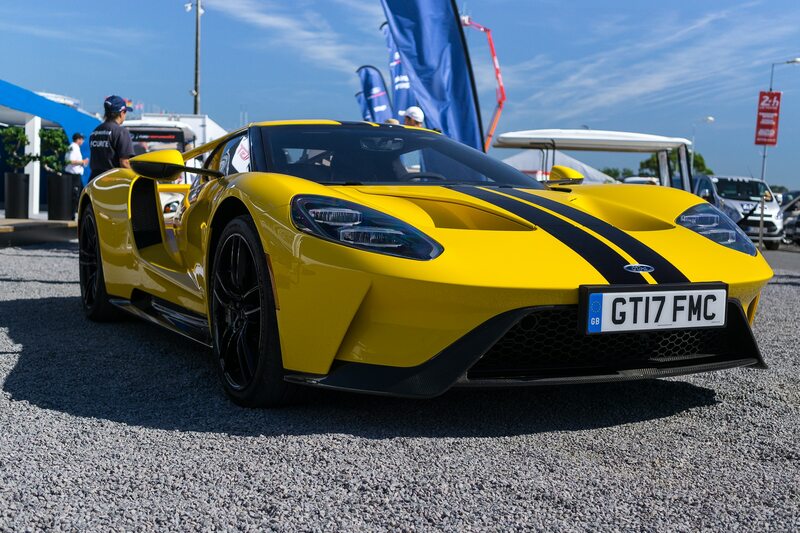 Despite the double disappointment, it was hard not to appreciate what we had just witnessed – maybe the most insane, absurd and challenging way to test both the cutting edge of automotive technology and the human limits of continuous partying. 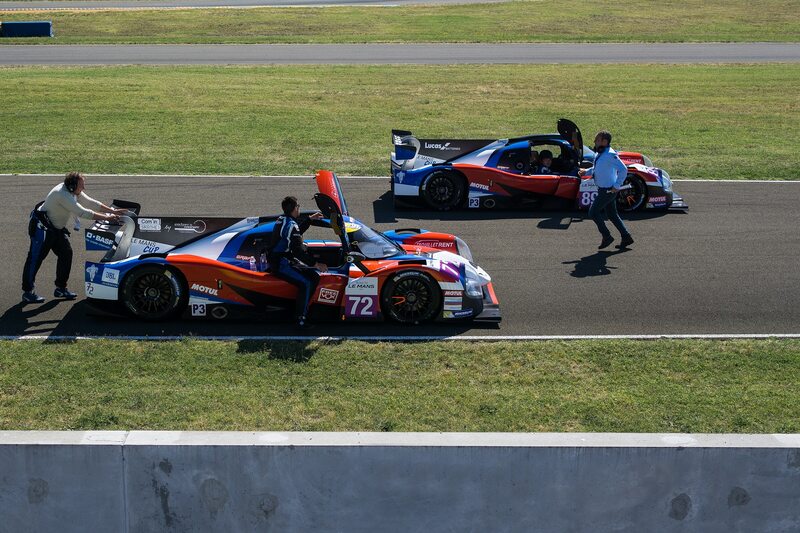 Back in camp, the Frenchmen were at it again – this time stopping cars with a pit stop sign and frantically washing their windshields before releasing. 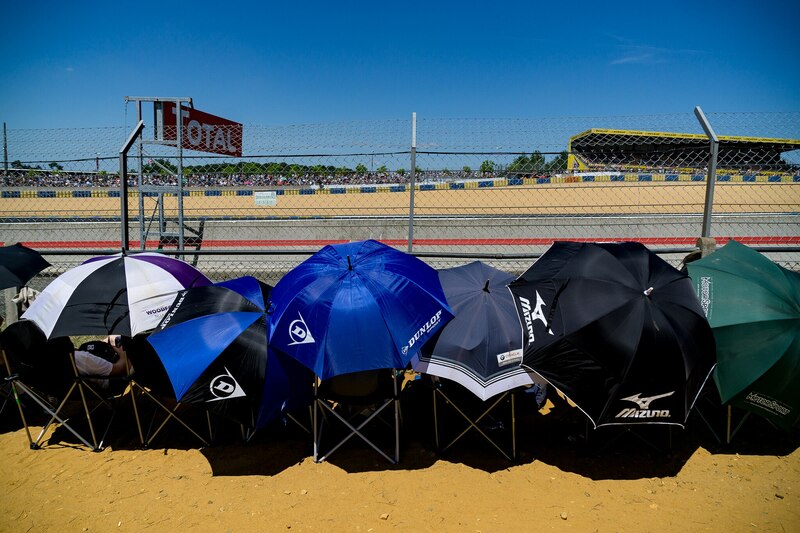 Even for some of the spectators, the race never ends.